In their second season of existence, the Jacksonville Jaguars had gotten off to a 4-7 start. They were performing in typical fashion for a recent expansion team, but then they reeled off five straight wins to finish the year. 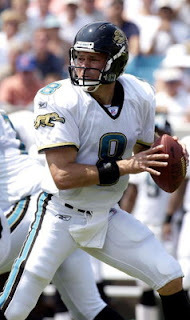 The Jaguars not only ended the 1996 regular season with a winning record of 9-7, but finished in second place in the AFC Central and qualified for the postseason as a wild card entry. Head Coach Tom Coughlin’s team featured third-year QB Mark Brunell, who led the NFL with 4367 passing yards and 7.8 yards per attempt. Wide receivers Keenan McCardell and Jimmy Smith emerged as outstanding receivers, but it was the running game that keyed the season-concluding winning streak. Veteran RB Natrone Means (pictured above), formerly of the Chargers, gained 364 of his 507 rushing yards in the last five games. The defense benefited from the addition of eleventh-year veteran DE Clyde Simmons (pictured below left) and rookie DE Tony Brackens, as well as rookie LB Kevin Hardy. 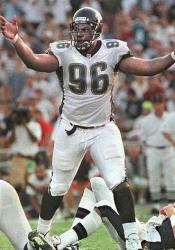 The Jaguars went on the road for their first playoff game, facing the Buffalo Bills at Rich Stadium on December 28. The Bills, coached for the eleventh season by Marv Levy, went 10-6 to end up second in the AFC East. Many of the key players who had helped Buffalo to dominate the AFC at the beginning of the decade were still vital to the club’s success, but were also showing the effects of aging and wear-and-tear, including 36-year-old QB Jim Kelly, 30-year-old RB Thurman Thomas, and 32-year-old WR Andre Reed. Defense had mostly carried the club during the season, in particular DE Bruce Smith, still an elite player at age 34. There were 70,213 fans at Rich Stadium, a venue where the Bills had never lost a postseason game, on a cloudy day with temperatures in the fifties. Following a punt by Jacksonville, the Bills drove 43 yards in six plays to score the game’s first touchdown on a seven-yard pass from Kelly to Thomas. However, on Buffalo’s third possession the veteran defensive end Simmons intercepted a shovel pass from Kelly that was also intended for Thomas and returned it 20 yards for a touchdown. The Bills came right back with a ten-play drive that included four pass completions by Kelly and ended with a two-yard touchdown run by Thomas over right tackle. But the Jacksonville offense, which had not been able to move thus far in the game, was spurred by a 62-yard run by Means to the Buffalo five. The drive stalled there, but Mike Hollis kicked a 27-yard field goal and the score was 14-10 after one quarter. The Bills had to punt following their next possession but regained the ball when a long Brunell pass was intercepted by CB Thomas Smith in the end zone. Buffalo proceeded to mount another long drive that included three pass completions to WR Quinn Early that totaled 31 yards. But on fourth-and-one at the Jacksonville 16 yard line, Kelly’s attempted quarterback sneak was stopped short. The Jaguars regained momentum as Brunell threw to TE Pete Mitchell for a 47-yard gain into Buffalo territory and then Means ran for a 30-yard touchdown. Jacksonville was ahead for the first time at 17-14. The Bills managed a 33-yard field goal by Steve Christie at the two-minute warning while Jacksonville came up empty on its last possession of the half when Hollis was short on a 58-yard field goal attempt on the last play before halftime. The score remained 17-17 at the intermission. Buffalo’s opening drive of the third quarter resulted in a 47-yard field goal by Christie that put the Bills back in front. The teams traded punts before the Jaguars moved 62 yards in 11 plays, featuring a 27-yard pass completion from Brunell to McCardell, and culminated in a 24-yard Hollis field goal to again tie the game at 20-20. On the second play of the fourth quarter, Buffalo CB Jeff Burris intercepted a partially deflected Brunell pass and returned it 38 yards for a touchdown and 27-20 lead for the Bills. The Jaguars responded by driving 65 yards in 10 plays that resulted in a two-yard TD pass from Brunell to Jimmy Smith, and with the successful PAT the game was again tied. On Buffalo’s next series, Kelly fumbled when hit by safety Chris Hudson and CB Aaron Beasley recovered for the Jaguars at the Jacksonville 42. Brunell completed passes of 14 yards to Smith and 11 to McCardell in setting up a 45-yard field goal attempt by Hollis that hit the right upright but caromed on through for three points. Todd Collins replaced the injured Kelly at quarterback for the Bills and was unable to move the team in two possessions while the Jaguars were able to run a minute-and-a-half off the clock. Brackens forced Collins to fumble in the last seconds to nail down the 30-27 win for Jacksonville. The Jaguars outgained Buffalo (409 yards to 308) although the Bills had the edge in first downs (19 to 18). 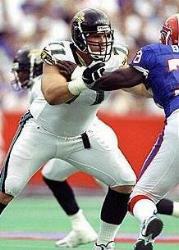 Buffalo suffered more turnovers (three to two) and only managed to sack Brunell twice as offensive left tackle Tony Boselli (pictured at right) had an outstanding day against Bruce Smith. Natrone Means had a big day running the ball for Jacksonville, gaining 175 yards on 31 carries with a TD. Mark Brunell (pictured below) completed 18 of 33 passes for 239 yards with a touchdown against two interceptions. Jimmy Smith caught 5 passes for 58 yards and a score while Keenan McCardell gained 76 yards on his four receptions. In his last game before retiring, Jim Kelly was successful on 21 of 32 passes for 239 yards with a TD and an interception. Quinn Early caught 9 passes for 122 yards, but the Buffalo running game was held to 92 yards on 29 attempts – Thurman Thomas led the way with 50 yards on 14 carries. 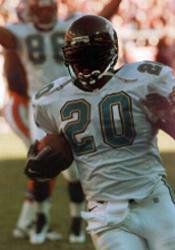 Jacksonville advanced to the AFC Championship game after beating Denver in the Divisional playoff round, but the prospect of a Super Bowl between the two 1995 expansion teams (the Carolina Panthers had similarly advanced through the NFC postseason) ended when New England handily defeated the Jaguars for the AFC title (the Panthers also lost the NFC Championship game to Green Bay). For Buffalo, it was the end of the postseason road in the Levy era. The Bills dropped to 6-10 in 1997, and while they were back in the playoffs in ’98, it was under a new head coach (Wade Phillips), Kelly was retired, and Thurman Thomas only a shell of his former greatness (381 yards rushing for the year).